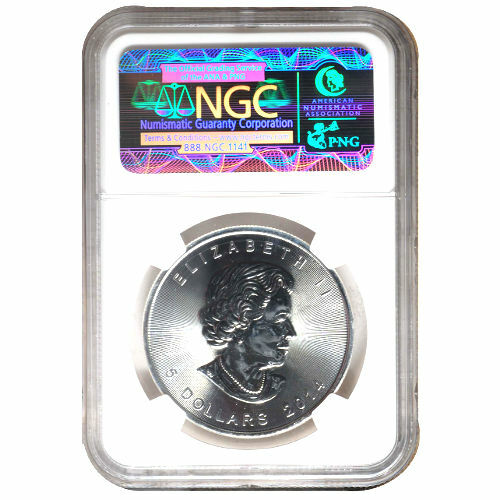 One of the finest mints in the world, the Royal Canadian Mint, and Silver.com are proud to announce the availability of the 2014 Canadian Silver Maple Leaf (NGC-MS68). These silver coins were redesigned with exciting, new features such as light-refracting, radial lines and a privy maple leaf mark that serves as an aesthetic security feature. In addition, this brilliant coin also includes a micro-engraved “14” to indicate its issue year that is visible only under magnification. On the coin’s reverse side, the radial design makes the leaf appear as thought it is glowing slightly, a beautiful feature that further enhances the superior craftsmanship of the coin. In addition, the 2014 Canadian Silver Maple Leaf is stamped with the words CANADA and FINE SILVER 1 OZ ARGENT PUR. On both sides of these words are the numbers .9999 to indicate silver percentage. Also on the obverse side is the Queen’s stately portrait, shining and smooth in contrast to her background, which is further detailed by the words “ELIZABETH II, 5 DOLLARS, 2014”. All coins included in this collection of are designated a Mint State 68 (MS68) grade by the Numismatic Guaranty Corporation. Coins considered “MS68” are extremely high-grade coins that carry exceptional luster and absolutely no contact marks. 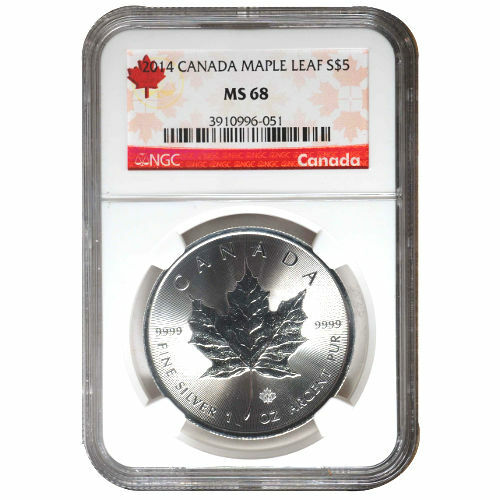 Moreover, the 2014 Canadian Silver Maple Leaf as well as all coins in the series have been sealed individually in their Numismatic Guaranty Corporation certified cases to prevent damage during shipment. Find out more about the one-of-a-kind 2014 Canadian Silver Maple Leaf coin by calling our representatives at 888-989-7223. We also offer live chat services on our website for immediate answers to all your questions about this coin or anything else. We look forward to hearing from you.